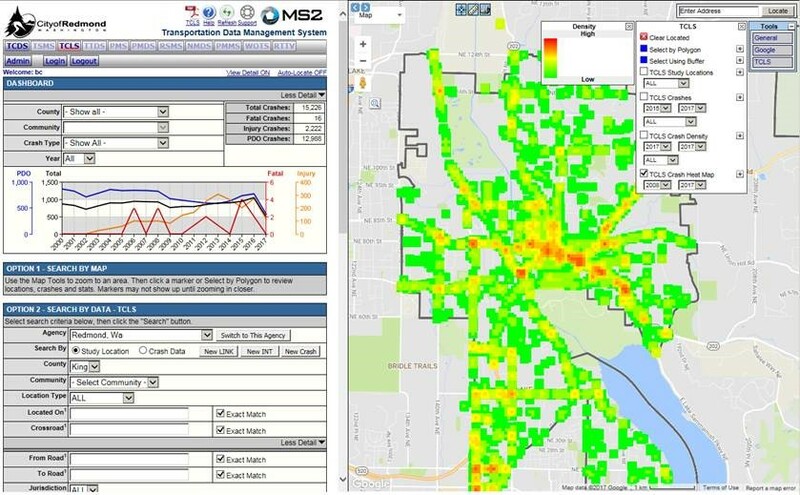 Adding vehicle volume data into MS2’s Traffic Crash Location System (TCLS) benefits traffic engineers since the software can then calculate severity and crash rates at study locations. But sometimes traffic count data is not available at all study locations. What to do? Our client, the City of Redmond, Washington, has a good solution – use turning movement count data (TMC) to derive vehicle volumes and enter those values into the TCLS. The City of Redmond conducts traffic counts on an annual basis. To keep costs low, volume and classification counts are conducted on even years and turning movement counts on odd years at select City sites. 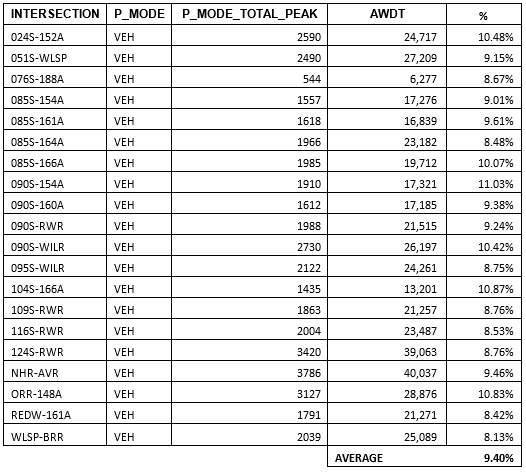 To fill in the gaps when volume counts are not conducted, estimated ADTs are derived from TMC peak hour data. Total entering volumes at the intersection during the peak hour is divided by a factor to obtain the estimated ADT. For Redmond, the factor to use is generally 8 to 12% and is updated periodically by comparing a sample of TMC data throughout the city with actual volume counts in the prior year. Below is a sample of AWDT volumes to determine the entering volumes for a sample of intersections. The 8-12% factor appears to be correct. In Redmond’s case, dividing the total peak by 9.4% is a reasonably accurate estimate.